Generations of war with the savage Draxx have left humanity desperate for a way to gain the upper hand. A chance to turn the tide in their favor is all legendary Captain Nicholas Driscoll needs to hear to lead an expedition behind enemy lines to the Chimera Nebula - a region of space so unstable it remains largely uncharted. Lieutenant Michael Summers sees an opportunity to matter, a chance to let future generations exist in a universe without constant war. He and other brave young cadets join the Manhattan for its first dangerous mission - to penetrate the Chimera Nebula and discover what it is the Draxx are doing in there. But first the ship and her crew will be tested by enemies both outside and within . 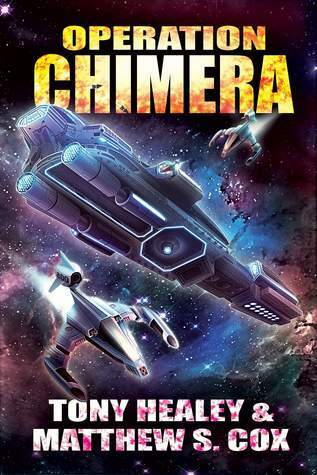 . .
Operation Chimera is a fast moving sci-fi novel which follows a group of rookie pilots, fresh from the Academy, out on their first mission. Most of the crew on the Manhattan are very new, and they all know it's potentially a suicide mission, pitching themselves into the middle of a war, on an untested ship, with an untested crew. We get to know our new pilots and the leaders of the Manhattan over the course of the book, as the story shifts POVs often to cover all of the plot lines. There are a lot of characters to get to know, and it can be hard to remember who is who at first, but eventually the story narrows in on a core set of characters to follow. They somewhat follow stereotypes: the stoic captain with the haunted past, a collection of hot-shot rookies (one of whom is pretty grossly sexist but is also taken to task for it by his fellow pilots), the privileged pilot out to prove herself, a wacky droid, etc. But they're still entertaining to read about, even though they're somewhat formulaic. I enjoyed the diversity of this book: there were a good number of women playing major roles, and what's a sci-fi story without plenty of fascinating types of aliens? I definitely found myself wanting to know more about the universe, and since it looks like this is the start of a series, I'm guessing there will be plenty of opportunities in the future to find out about the different cultures, traditions, etc., of the characters. At times, the writing could be a bit dry, but overall I found it to be a very engaging read. I could easily see this being turned into a TV show or movie, because some of those space fights would be really fun to watch. Like I said, I'm curious to know more about the universe created in this book, so I definitely wouldn't mind picking up the next book in the future. Born in a little town known as South Amboy NJ in 1973, Matthew Cox has been creating science fiction and fantasy worlds for most of his reasoning life. Somewhere between fifteen to eighteen of them spent developing the world in which Division Zero, Virtual Immortality, and The Awakened Series take place. He has several other projects in the works as well as a collaborative science fiction endeavor with author Tony Healey. Hobbies and Interests: Matthew is an avid gamer, a recovered WoW addict, Gamemaster for two custom systems (Chronicles of Eldrinaath [Fantasy] and Divergent Fates [Sci Fi], and a fan of anime, British humour (<- deliberate), and intellectual science fiction that questions the nature of reality, life, and what happens after it. He is also fond of cats. 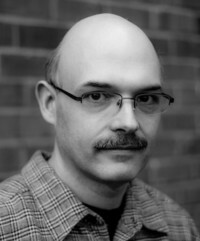 Tony Healey is a best-selling independent author. Born in 1985, he has lived his entire life in the city of Brighton, UK. In 2011, he found his fiction published alongside Harlan Ellison and Alan Dean Foster. A year later, his sci-fi serial FAR FROM HOME became a best-selling sensation, followed by similarly successful sequels. Since then he has collaborated with authors Bernard Schaffer, Matthew Cox and William Vitka on various projects. He has also had work published by Curiosity Quills Press. He is married and has three daughters.